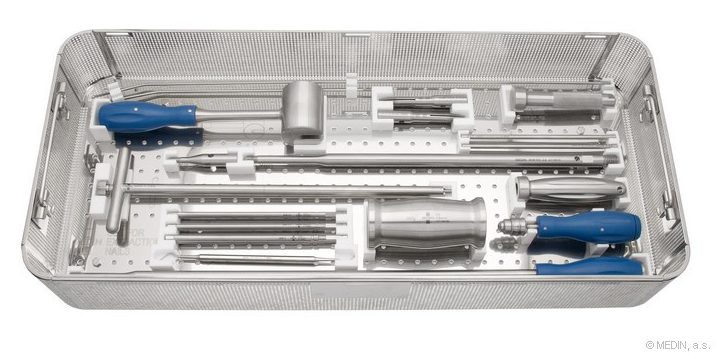 The set is intended for routine extraction of nails and extraction of damaged nails, which cannot be removed with common procedures. 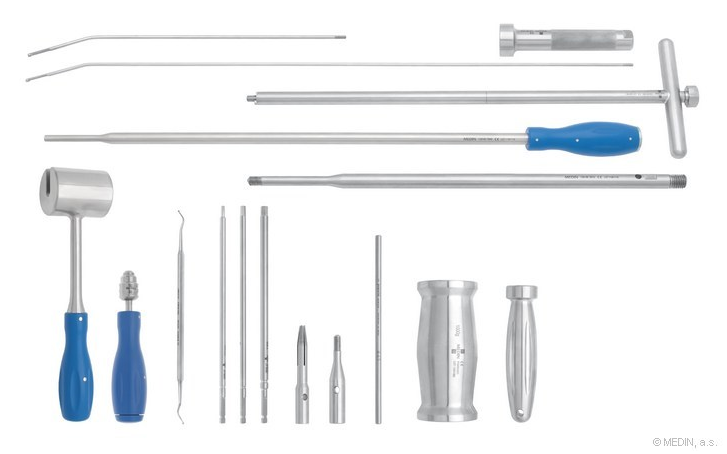 Screwdrivers are equipped with AO terminal extension, which can be fixed in a drill or AO terminal handle. All instruments are marked with the size of the nail they can be used for. Screwdrivers match the size of the inner hexagon of the screw. Use excavator to clean the thread. Insert the M6_M8 extractor into the nail and pull to make sure that it fixes the nail. Then put on the pull rod, mallet and handle and to try to extract the nail with light strokes. If the cannulated nail is broken, do not pull the nail in parts, but try to extract the nail as a whole. Screw on the handle of the extractor to the selected length of the extractor and extract the nail with light strokes using a 400g mallet. If the nail cannot be extracted in whole, or it is a full nail and some parts cannot be extracted with extractor, it is possible to use a punching rod and knock the remainder of the nail on the side opposite to the side of nail insertion. Use excavator to clean the inner thread if the nail. Screw an extracting rod with mallet and handle into the M8 nails with inner thread and extract the nail with light strokes. If you are going to extract the M6 nails with inner thread, screw the M6_M8 pulling connecting piece on the rod and then again, knock the mallet, handle and nail out.